Chocolate puts a smile on your face. Stressed workers and teenagers in love alike swear by it, and there are sound psychological and physical reasons for this, dietician Silke Restemeyer says. "It's true that chocolate raises your spirits," says Restemeyer, who works for a nutrition association in Germany. "Chocolate contains a lot of tryptophan and fat. These constituents ensure that increased amounts of the neurotransmitter serotonin are produced in the brain, and this is what causes the happy feelings." Tryptophan is an essential amino acid. In addition, many people link positive memories of childhood with consuming chocolate. "And it produces a warm feeling in the mouth as it melts. This provides temporary distraction from stress and worries," Restemeyer says. But the pleasure is brief. 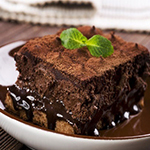 "After all, you can't eat that much chocolate for it to have a sustained beneficial effect -- and nor should you," Restemeyer says, pointing to the high fat and calorie content. One or two blocks from a bar of chocolate a day are perfectly acceptable to help you through moments of stress. "But then you should rather do without any other sweets or snacks and even without jam on your toast in the morning," she says. Dried fruit or fruit and nut mixtures provide high-energy alternatives for stressful moments at work or in your personal relationships. And you should consider carefully the times that you really need chocolate. Other responses to those moments when you crave chocolate are taking a short walk, drinking a calming cup of tea or doing relaxation exercises. All of these can help to dispel the blues and lift the mood. "It would of course be preferable to avoid the stressful situations where possible or to learn to cope better with them internally," Restemeyer says. This would turn chocolate into a pleasure to be enjoyed during a quiet moment, rather than something to be used as an antidote to stress.